-To create stunning and beautiful items out of wood. -To build furniture, doors and art that will last the lifetime of the owners. -To make a good living working wood into lovely forms. 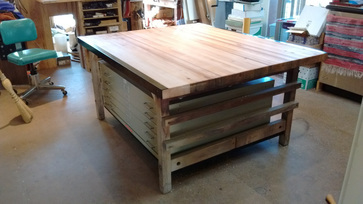 I try to build doors that will last the lifetime of the house, a redwood bed that will be given to ones children, or a side table that will be brought along from apartment to house to home. My Shop Andy’s Fine Woodworking is a small shop operation. I work hand-in-hand with my customers to take their ideas and create custom projects that exceed their expectations as well as meet their budgets. Building with the planet in mind is one of my critical objectives. I enjoy using reclaimed woods for new projects. I like reusing old building parts in new construction and remodels. I contribute sawdust to local garden growers. Building with the environment in mind means that all the solid wood waste I create goes to friends with small wood burning stoves, not to landfills. I focus on energy preservation on my Remodeling projects. The smaller the negative impact on our planet the better my business. 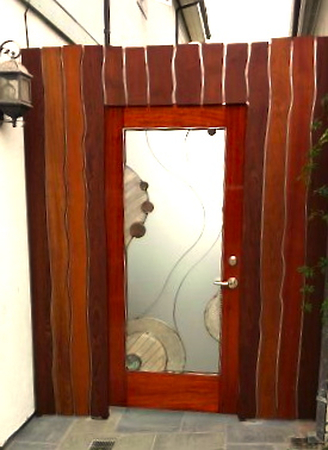 "Our new front door is a handcrafted, custom work of art! We absolutely love it! 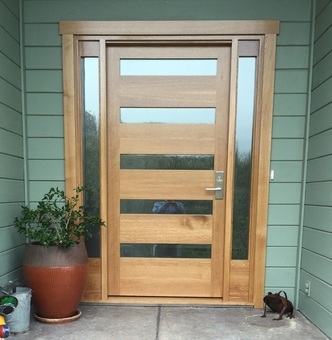 Andy was very easy to work with and successfully blended our vision of a new front door with his extensive knowledge of materials and design to create a beautiful solid oak front door that we are really proud to have at the entrance of our house. The installation was seamless. It fit perfectly in our space. The clear, protective finish on the door has been durable, withstanding both the Ben Lomond winter rain and summer heat. We are extremely happy with the result and know it was a good investment." "Just wanted to let you know that I really love the gate! We have received many compliments from people walking by. They even take pictures of it! You should leave your business card with me to hand out to perspective clients!" I still haven't seen it in person... But my Facebook posting of the picture has recd about 100 comments!! Carolyn's design savvy should not go unnoticed ... He he! Thanks for taking so much pride in your work." 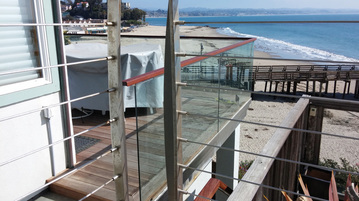 "Thank you very much for your excellent work on the deck! We keep looking out at it and marveling at how nice it looks, It is clearly a work of true craftsmanship. It was a lot of fun for me to work along side you on the project and it was very helpful to have your guidance on how far to go with the rebuilding." "There are so few people you encounter in life who are truly 'game changing' kind of people, and when you are lucky enough to do so, it's a fun idea to let them know you noticed! I can't thank you enough for your sincere interest in my 'project'. Great update as usual, and almost entertaining at this point..."
Andy! Thanks again SO much for my "new" workbench- it is quite beautiful and so functional. You did a wonderful job! I love it! (Heart) Looking forward to create with it for many years to come! Bravo!